David S. Abraham, an environmental analyst who has worked on Wall Street and in Washington, DC, offers a sober perspective in how the rarest mineral resources have become essentials of modern life. Most rare elements are used as only trace additives to otherwise common materials: a “dash” of indium turns inert glass into the touch-sensitive screens that banished buttons and dials and put a smart phone into everyone’s pocket. A sprinkling of neodymium or dysprosium can greatly enhance the magnetic strength of iron alloys, making it possible to create devices as diverse as TV loudspeakers and motors for electric vehicles. Those dashes and sprinkles add up to a lot in aggregate, and, as Abraham sees it, pose serious questions for the future development of high-tech, sustainable economies. Though a single hybrid or electric car uses only about 100 grams of dysprosium, and an industrial wind-turbine about 30 kilograms, the U.S. Department of Energy has projected an annual consumption of 8,000 tons if these technologies become signiﬁcantly more widespread. That is seven times more than the total amount mined and reﬁned in 2010. Scarcity of rare metals, in effect, may seriously limit our options for managing other, more abundant resources, such as fossil fuels, and may constrain efforts to rein in climate change. Such scarcity is inescapably political. As early as World War I, the United States declared it treasonous to export tungsten, used to strengthen steel. World War II, where winning strategies relied even more heavily on technologies like radar and air power, made reliance on scarce materials clear to policy makers, prompting President Truman to establish a Material Policy Commission in 1951. But predicting future resource needs is complex, fraught with uncertainties, and, because of the political element, often virtually impossible to control. In 2011, for instance, about twenty-one percent of the world’s supply of tantalum came from regions in conﬂict, like the Democratic Republic of Congo, leading to a sense of insecurity on the part of industries and governments about the continued stability of essential supply chains. And, of course, a major player in the rare earth trade, both as a supplier and, increasingly, a consumer, is China. Our reliance on scarce and unpredictable resources could augur a dismal future, but in a closing chapter, “How to Prosper in the Rare Metal Age,” Abraham sounds an upbeat note. 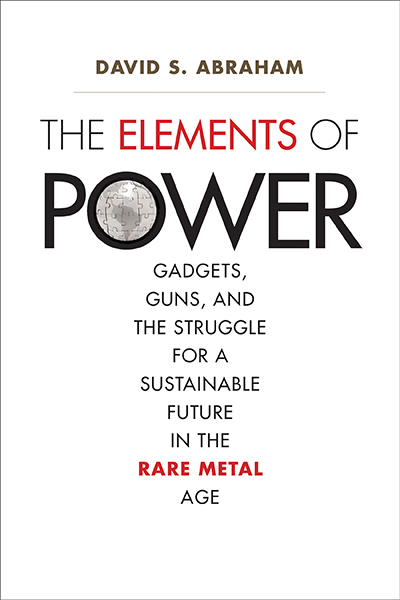 Rare metals present risks, he concedes, but further developments, both scientiﬁc and political, can help assure stability and sustainability without jettisoning the technological amenities we’ve come to take for granted—as long as everyone becomes more aware of the scarce materials that make our “guns and gadgets” so cheap and so powerful.